A Turkish Airlines flight made an emergency landing at John F. Kennedy International Airport on Saturday evening after 29 passengers, including a flight attendant, were injured when the plane encountered turbulence, officials said. According to a statement from the Federal Aviation Administration (FAA) and the city's Office of Emergency Management (OEM), the Boeing 777 was en route to New York from Istanbul when the aircraft encountered mid-air turbulence. There were 329 people on board, including 21 crew members, according to Steve Coleman, a spokesman with the Port Authority of New York and New Jersey. "It kind of jolted pretty quickly," passenger Amir Mehrbakhsh told ABC News. "There was like one or two seconds when it was subtle, but then it really started to pick up. ... Just because the drop was so sudden, a lot of people got lifted up and hit their head either on the ceiling or on the side of the plane, and so there were a lot of injuries pretty quickly." The turbulence occurred over Maine about 45 minutes prior to landing, authorities said. 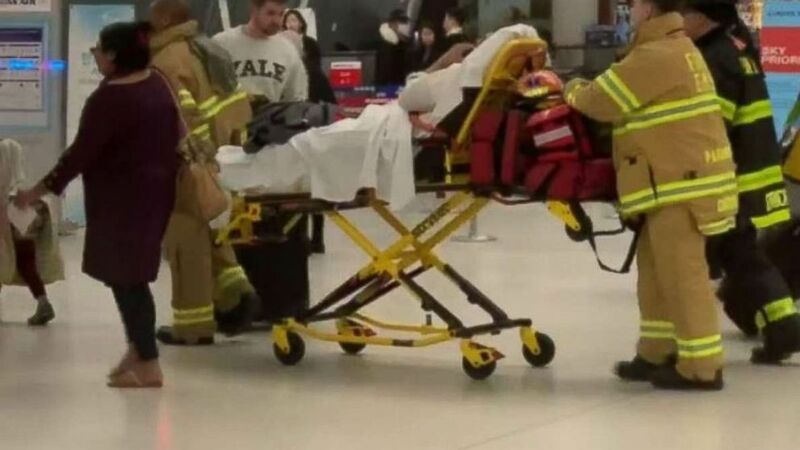 Most of the passengers were treated inside an airport terminal. Ten of the 28 passengers were taken to a hospital after the plane landed on Saturday at 5:35 p.m. Two crew members were also injured. Coleman said a flight attendant had a possible broken leg and others suffered bumps, bruises and cuts. "There was this one guy ... and he was frantically screaming," Mehrbakhsh said. "I think he was like doing a religious chant. I kept hearing him say 'Jesus,' like he was visibly distraught." Emergency first responders worked with Port Authority officials on scene to treat the injured, according to the FDNY.